More than just a checklist for graduation, major maps chart out potential career options and opportunities based off a student's individual interests and aspirations. These maps enable students, family, academic advisors, faculty and career counselors alike to identify on a student's end goal and create an individualized plan to help them get there in their own unique way. 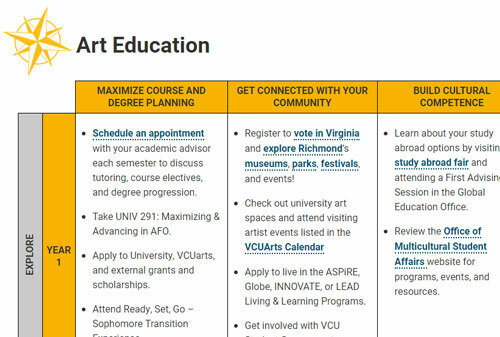 In short, major maps enable students to make the most of their time at VCU, and empower them to get what they want out of their academic experience. To learn more and to see major maps in action, visit majormaps.vcu.edu.